This shrub comes in many varieties and is largely grown for its foliage. The cultivar fortunei is an evergreen variety and the most common cultivar of this plant to be found in gardens. It has strongly coloured foliage. 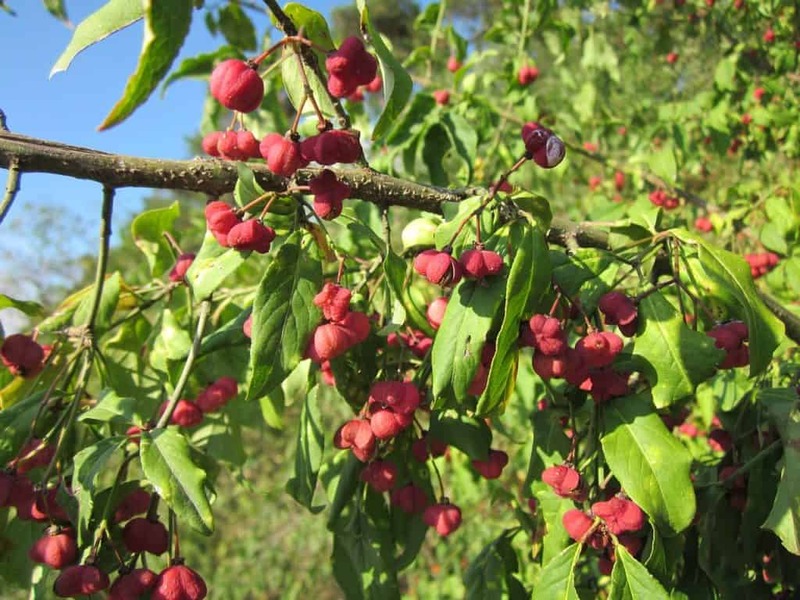 The common name, spindle tree, arose because the wood of this shrub was often used to make spindles for spinning wool. This is a useful, maintenance free shrub that can add colour and brightness, particularly to the winter garden with its variegated leaves. There are compact, large and creeping varieties. The creeping varieties provide good ground cover and are useful for covering fences and other structures. The compact varieties may be used as specimen plants, in the border, as underplanting for larger shrubs and trees or for hedging. Euonymus is a tough shrub that will tolerate most conditions and is useful for brightening up a difficult corner of the garden where little else will grow. This guide will explain how to grow this versatile shrub and which cultivars to choose. It will also offer advice on care, pruning and propagation. There is also advice on how to deal with any pests and diseases that may attack your shrub. This depends greatly on the variety. Creeping varieties can climb to heights of 20 feet (6 metres) while compact varieties top out at around 3 feet (1 metre). This also depends on the variety, however, there are types that will grow in a sunny position and some that tolerate quite a lot of shade. Euonymus comes in a range of varieties with quite different features, so choose carefully to make sure you get the right plant to suit your purposes. Some are large shrubs, some more compact and several varieties provide ground cover. Many are evergreen, and their variegated leaves stand out even on gloomy winter days. Euonymus does flower, however, the blossoms are quite small and insignificant which is why the shrub is largely grown for its foliage. This variety is a low growing shrub that has golden leaves edged with green. It is one of the most common varieties grown in English gardens. It is compact, reaching a height of 3 feet (1 metre). In cold winters, the leaves take on a pinkish hue. This shrub is tolerant of partial shade and so can be used to brighten up a dark corner of the garden. It is an evergreen variety and adds a spot of colour and brightness to the winter landscape. Euonymus alatus is often called burning bush or winged spindle. This is because of its stunning autumn colour and also the little corky ‘wings’ that appear on its branches. 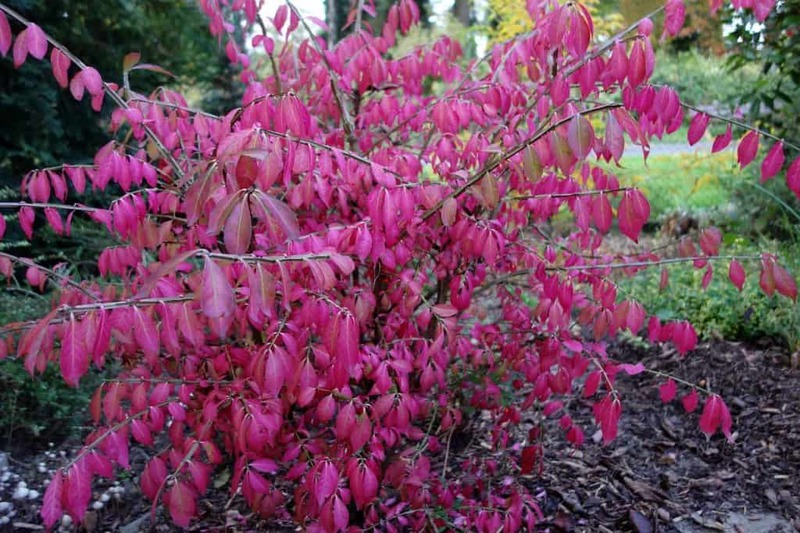 Its leaves turn flame red in autumn and can remain on the shrub for several weeks giving a long autumn display. It also features reddish-purple berries. This variety has variegated leaves of dark green with white edges. It usually reaches a height of 8 feet (2.5 metres). It is evergreen and again provides a splash of colour to the winter garden. It has inconspicuous flowers of pale green in summer which are sometimes followed by pale pink fruits in autumn. This variety is often called wintercreeper and is a groundcover or climbing variety. It has deep green leaves which turn an attractive rose-pink in the autumn. Harlequin is a compact, low growing, evergreen variety that can be used as hedging. It has green leaves mottled with creamy-white splashes that become tinged with pink in the autumn. This variety reaches a height of only 80cm (30 inches) and can be grown in containers or under taller plants. It can suffer if planted in full sun and will be less colourful if grown in deep shade. Dappled sunlight or morning sun and afternoon shade suit this variety best. Atropurpureus is a wonderful shrub for autumn interest. Its leaves change to a bold purple shade and it also bears scarlet berries. It’s a larger variety reaching a height of 3-5 metres (10-16 feet). Red Cascade is a deciduous variety that is often grown for its spectacular autumn interest. Its oval leaves turn bright red in winter and it has rose-pink berries that open to reveal orange seeds. Euonymus is a very easy shrub to grow and will tolerate a wide variety of conditions. It also requires very little maintenance once established. This shrub will tolerate quite a lot of shade, making it ideal for a darker corner of the garden. However, it may lose some of the variegation on the leaves if it is planted in very deep shade. Once established, this shrub will require little watering and is tolerant of drought. Euonymus prefers reasonably well-drained soil. However, it is a tough shrub that will cope with less than ideal soil conditions. Like most plants, these plants do not like to sit in waterlogged soil, however, they will tolerate very alkaline soil. These shrubs do not usually require fertiliser. However, you may like to add a handful of blood, fish and bone when planting to get your shrub off to a good start. If the shrubs are planted in very poor soil or in a container, then a slow release shrub fertiliser may be used. Euonymus can be planted at any time as long as the soil is not frozen. However, the optimum times for planting are mid-March to April or September to October. The shrubs will do well in most sites but do ensure that there is adequate air circulation around the plant. If the plant is, for example, tucked in a corner between two fences or closely surrounded by other plants it may become susceptible to disease. Dig a hole twice the size of the root ball. Work in a handful of blood, fish and bone or other shrub fertiliser. Plant your shrub so that it is level with the ground and firm in to remove any air pockets around the roots. Water your shrub in well. For the first year of its life, your shrub will need to be watered regularly. After this, the roots will have established well enough that it can fend for itself in all but the most exceptional conditions. Once established your shrub will require little in the way of maintenance. If conditions are exceptionally dry it may need watering. It will not require feeding unless it is grown in a container or is in exceptionally poor soil. Container grown varieties should be re-potted once the root system becomes overcrowded. Choose a pot slightly larger than your shrub’s current home and use a multi-purpose peat-free compost. Water your shrub well after re-potting to settle the soil around the roots. As euonymus do not have stunning blooms, planting them with more showy flowers often works well. Many gardeners like to underplant the shrub types with spring bulbs to brighten the garden early in the year. The variegated leaves of this shrub also look good against a background of darker green foliage such as Mahonia or Holly. Different types of euonymus also look good when planted together as they have such varied forms and colours. Euonymus is a relatively slow-growing plant that will require very little pruning. As with any variegated specimen, occasionally, new shoots come through without the variegation. These stems should be cut back to the main stem. Six months after planting, you may like to prune your shrub back to encourage bushy growth. Simply cut back a third of the growth with sharp shears or secateurs. If you wish to prune your shrub to maintain its size this should be done in April or May. Select a low growing branch that will easily reach the soil. At the point where the stem touches the soil, scrape away an inch or so of the bark with a sharp knife. The new roots will develop from this point. You can then pin down the branch with a piece of wire, tent peg or landscape fabric anchors. Mound some soil over the area and keep this well-watered until the cutting has taken. In a few weeks, once your new cutting has put on some new growth, you can remove it from the soil, cut it away from the parent plant and pot up the plant. Let it grow in the pot for a few weeks or months until its roots are well established before moving it to its chosen location in the garden. Semi-hardwood cuttings should be taken in spring when the new growth is still soft and flexible. Water the parent plant a day or two before you plan to take a cutting if the weather has been very dry. Cuttings should be taken in the morning when the stems are full of sap. Prepare a 4-inch pot with potting compost, filled an inch from the top, for each of the cuttings. Make a hole with a pencil or dibber. Choose a new shoot and cut about 10 cm (4 inches) from its tip with very clean, sharp secateurs or a pruning knife. Remove the lower leaves and dip the base in rooting hormone powder. Put your cuttings into the prepared pots and firm in. Mist the soil lightly. Cover your pots with a large plastic bag secured with an elastic band, or place in a cold frame, greenhouse or propagator. Put in a warm sheltered place but not in direct sunlight. Mist the pots whenever the soil dries out. Once the cutting starts to put on new growth you can remove the plastic bag. Continue watering regularly. Euonymus is usually a tough, disease and pest resistant plant. However, it may occasionally succumb to certain pests and diseases. Many of these can be reduced by good plant care. Plants that are under attack from euonymus scale will often have weak growth. They may also lose leaves on the inner stems and lower branches. You may see signs of the mature female insects on the stems. They appear as brown or black patches on the stems. They have a protective outer coating and are barely recognizable as insects looking more like a growth on the stem. The grey/white male insects appear on the leaves, primarily the underside, between May and September. The females lay eggs which become crawlers. Pesticides are only effective against the crawlers and young adults. Once the insects have matured and are covered with their waxy coating they are impervious to such treatments. This means that if you use a bug spray you will need to apply it in mid-May and then at intervals after that to break the life cycle of these bugs. The most common disease euonymus experiences is powdery mildew. The symptoms of this disease are a white, powdery coating on the leaves, especially new growth. Eventually, the leaves go brown and drop off. Powdery mildew often occurs in humid environments. If the weather is warm and damp this disease is more likely to thrive. To prevent the problem, ensure there is adequate air circulation around your plants. This might involve cutting back surrounding plants or thinning the growth of your euonymus a little to allow the air to circulate freely. You should also remove affected growth. Do not overwater your shrub and water at the roots rather than all over the foliage. Watering early in the day gives the leaves a chance to dry out in the sun. Do not fertilise your plant when it is affected as this will cause new, sappy growth that is more vulnerable to infection. There are also commercial fungicides available. Q My Euonymus had beautiful variegated leaves when I first planted it but now they are all coming through plain green. What can I do to get the wonderful colour back? Variegated leaves come about from plantsmen cultivating plants that have a mutation that causes different coloured leaves. Unfortunately, variegated foliage can go back to being plain green. This is called reversion. Firstly, cut back and stems that have plain green growth to the main stem of the bush whenever you see them. Secondly, prune the bush back by one third in spring to encourage dense, bushy growth. This new growth should have the lovely variegated colour. If your entire shrub has reverted to green leaves you can cut it back severely in winter. This should result in new variegated growth the following spring. Depending on the variety of your euonymus, it may need to be in a position that receives more sunlight as this encourages the variegated growth. You could move your shrub or alternatively cut back other shrubs or trees to let in more light to your plant. Q I planted several euonymus about six weeks ago, but they do not show any signs of growing. What could be wrong? Your new plants probably just need some time to establish their root systems before putting on new foliage. If the existing foliage is healthy, then there is nothing to worry about. Once your shrub had established it will soon put on plenty of new growth. Once this happens, you might like to cut back the foliage by one third to encourage bushy growth in the future. To support your new plants, you could fertilize them with a slow release shrub fertilizer, this may help them, along, especially if the soil is poor. Also, make sure you water them regularly, but do not keep them in waterlogged soil as this can encourage the roots to rot. Q The leaves of my euonymus are turning brown and dropping off. What is wrong with my plant? Shrubs will sometime lose their lower leaves as a natural part of their growth cycle. However, if this is happening to lots of the leaves it suggests your shrub may be waterlogged. Try reducing the amount of water it receives to see if this helps. Ultimately, you might need to improve the drainage of the area or move your plant to a less soggy part of the garden.